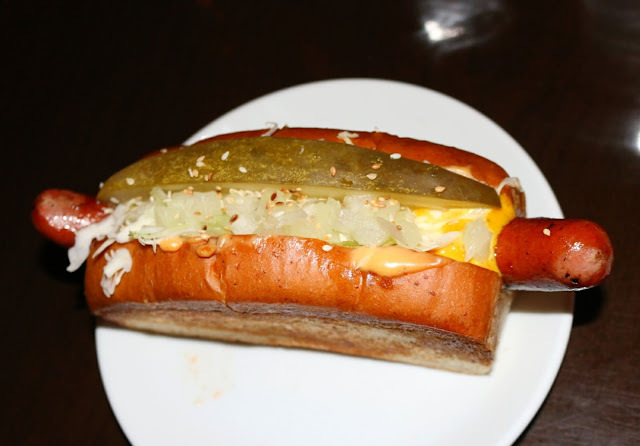 There are some that say a traditional American hot dog shouldn't be adulterated or a simple brat with mustard and kraut can't be improved. I heartily disagree. 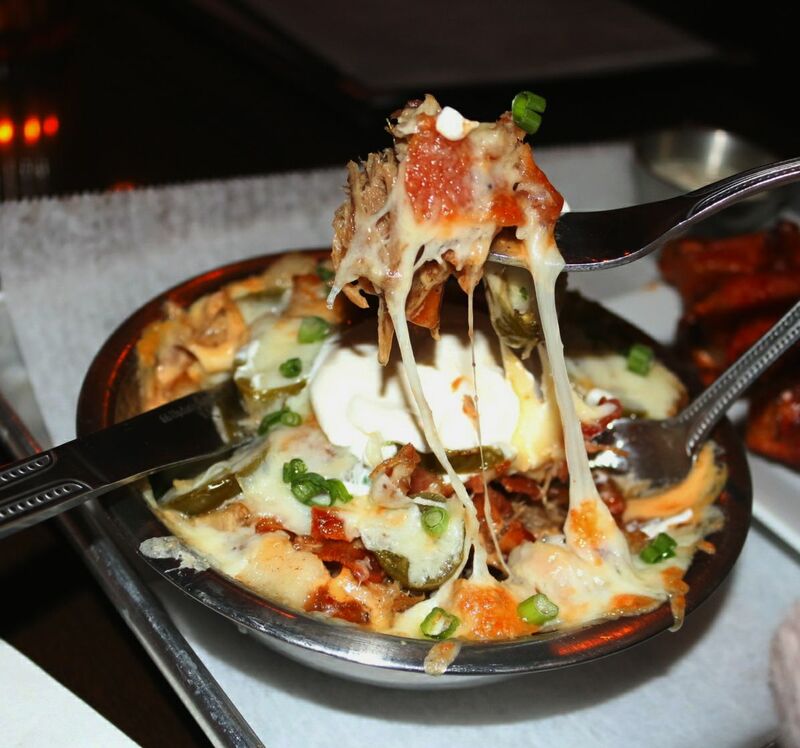 But it's not as simple as piling on a myriad of toppings that don't make sense. It's all about creating that perfect marriage of flavors to ensure a flavor bomb. Jimmy Cronk and Sean Hosty of Destination Dogs may have deciphered the road map to the perfect haute dog. Jimmy & Sean clearly have a passion for both food and travel. Whether it's the drinks or dogs, everything has an airport symbol tagged to it. Looking for flavor from Spain? 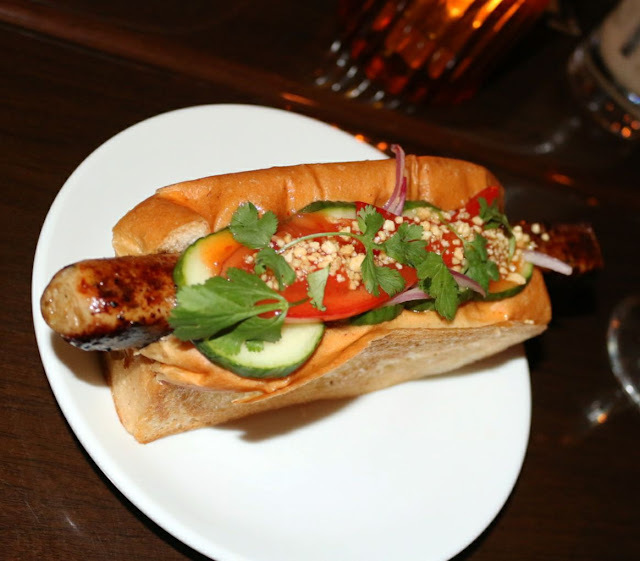 Head to Barcelona (BCN) for a taste of their Conquistadog, featuring chorizo and patatas brava. Francophiles will delight by arriving at Charles dog Gaulle (CDG), with duck confit, shaved foie gras, and cornichons. The bar and restaurant space is a destination in itself, with plenty of folks coming in for happy hour and easily staying late into the night. 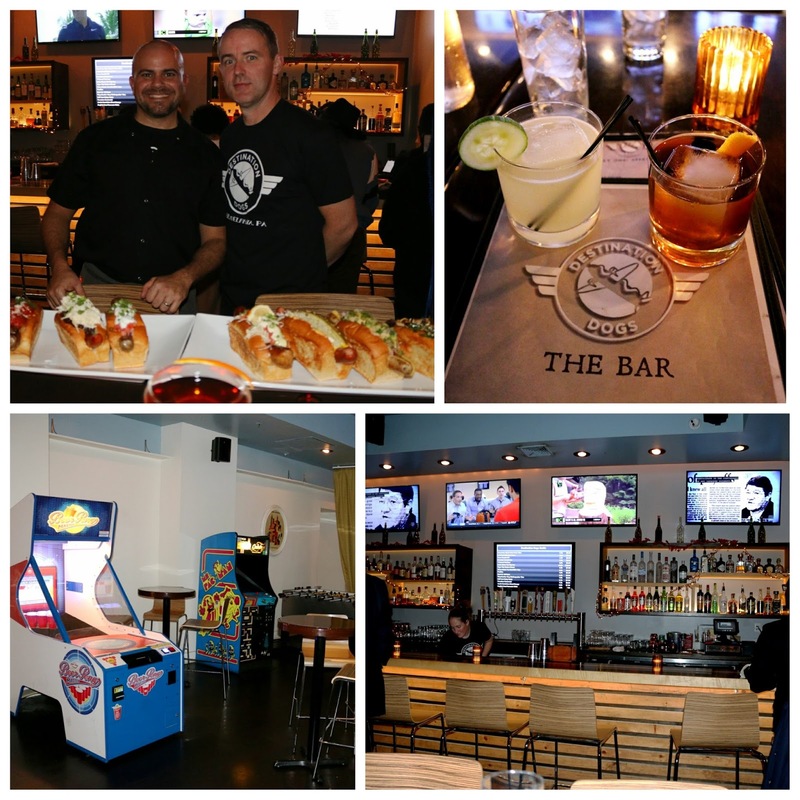 A retro game room is ever expanding (think pool, foosball, and 90's arcade games) and it's a bi-level establishment with plenty of room for private events and a good HH group. 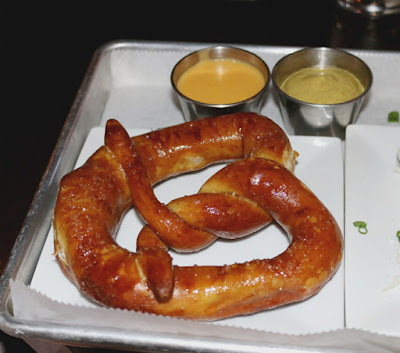 And while you can expect great HH deals at the bar, the great thing about Destination Dogs is that they've definitely gone beyond any of the typical haute dog joints we've seen come and go in Philly. Case in point - expect hand-crafted cocktails. I was a big fan of the Town & Country hailing from Texas. A subtly sweet take on a Manhattan, the maple syrup and Carpano Antica brought forth the undertones of the bourbon nicely. Check out the large format ice cubes - clearly not your typical HH joint. GF's taken to gimlets lately and was enamored with their cucumber iteration. Properly emanating Heathrow, this was light with pressed cucumber, mint, and elderflower, there's a bit of citrus kick from the lime. They're constantly trying out new concoctions as well so be on the look out for the La Zona Rosa & Brazillionaire. 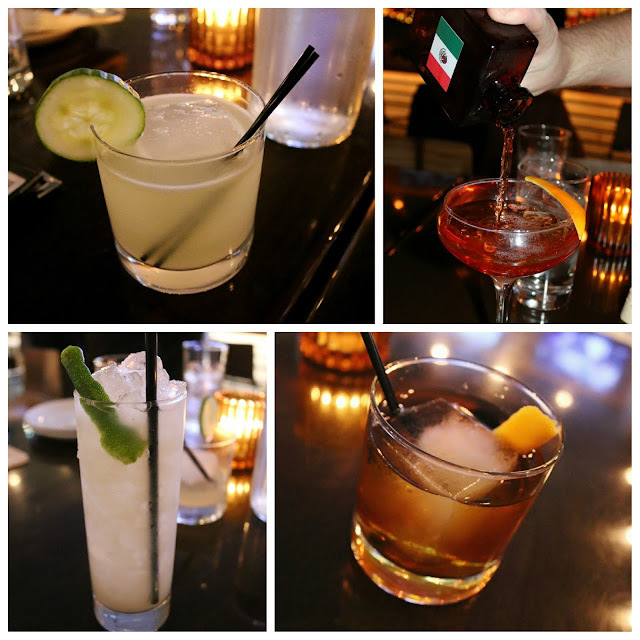 La Zona Rosa features the depth of reposado tequila, matching up with the smokiness of mezcal. Bitter citrus notes from the aperol and the angosutra, orange, and spanish bitters really come through, further mellowed out by the sweet caramel notes from the Amaro Meletti. The GF was a fan of the Brazillionaire, a creative take on Brazil's Caiprinha, with the requisite cachaca showcased, along with Soursop, brazil nut, and lime. Again - not just about the dogs here. 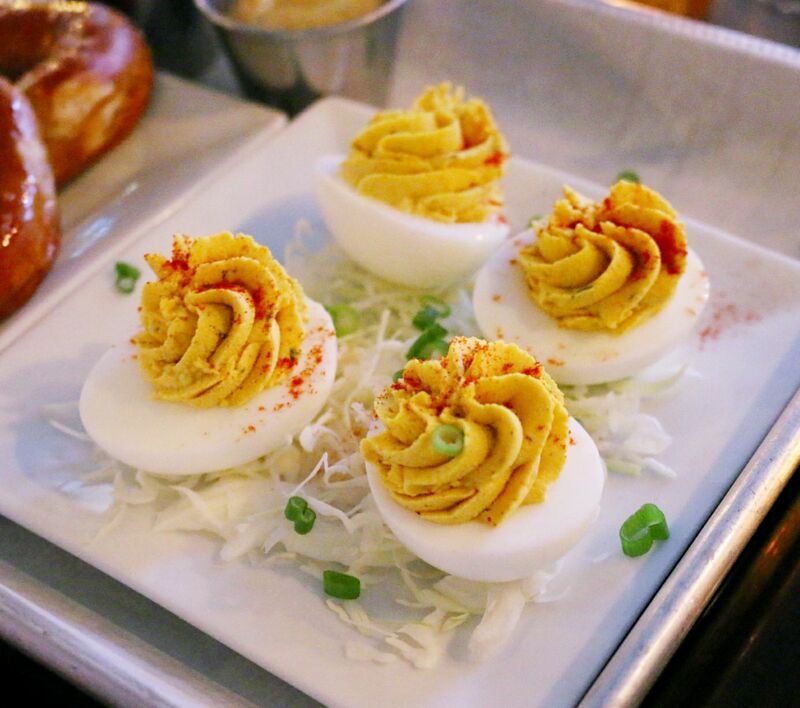 Deviled eggs were some of the best I've had in recent memory. The whites trembling with the yolk custard really made by the hit of mustard. 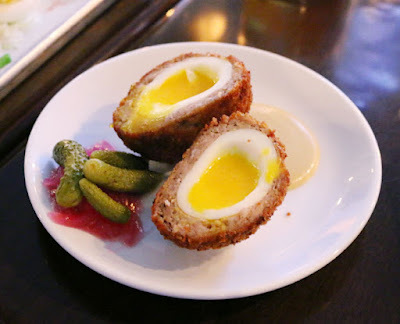 Scotch egg was beautifully presented, with a fried breakfast sausage encasing a perfectly set soft-boiled egg. Nicely paired with pickled red onions and cornichon for acid and Dijon honey mustard if you're destined for a sweeter route. Their large-format pretzel is perfect at the bar and comes with both cheese sauce and some spicy mustard. 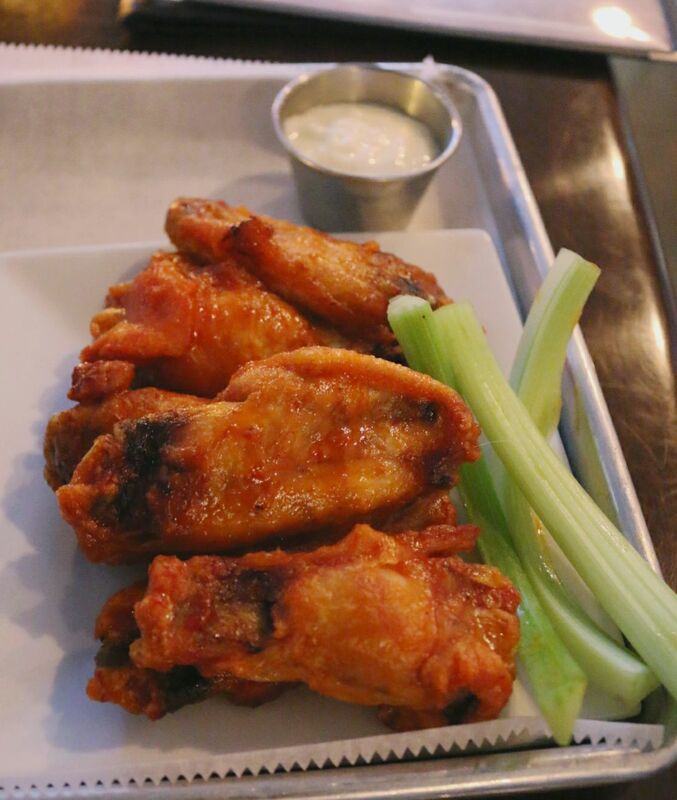 Their buffalo wings are also right up HH's alley. Crispy on the outside and juicy within, you'll be happy with half a dozen of these. For obvious reasons, I'd recommend going ridiculas with their patatas. You can't go wrong when you have fried potatoes topped with rich duck confit, unctuous pork belly, and crisp bacon. This is all topped with brown gravy and two cheese to create a gustatory bomb that will pair with a beer nicely. 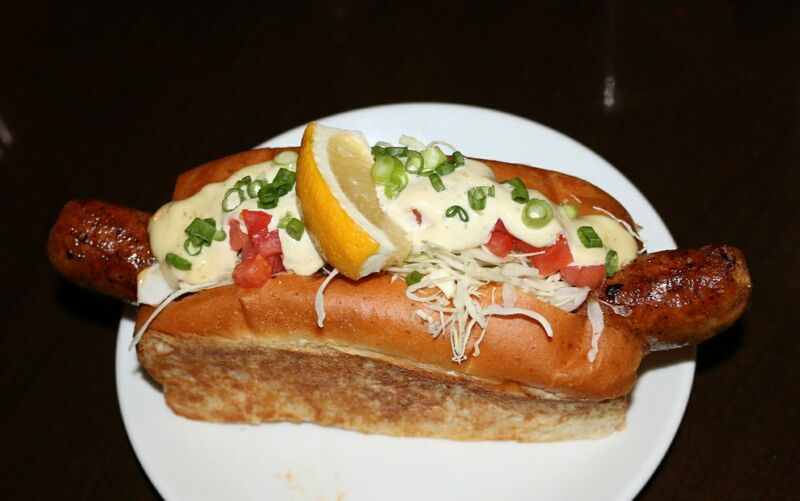 Of course in the end ... it's all about their haute dogs. Delineated as domestic and international dogs on the menu, it's easy to get lost, but it's delicious delightful where you'll end up. Cali health nuts won't be lacking any flavor with the Oscar. 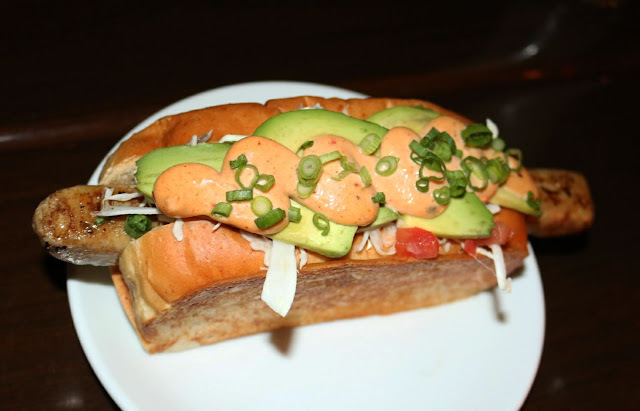 Definitely a winner with the GF with the chicken sausage, with heft coming from the avocado and chipotle mayo. The bread housing their dogs is a winner - light, fluffy, and nicely toasted. Pto-tip: Surprisingly holds up well as next day leftovers too! 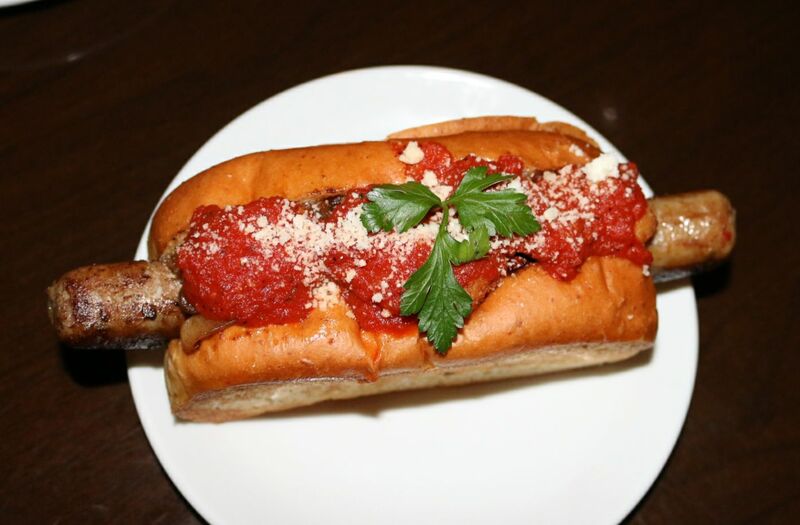 Destination Dogs also feature a bevy of unique sausages as well. Python sausage wasn't gamey at all and clearly lean. Pepper jelly provided a hit of flavor, with freshness from the crisp cucumbers and cilantro. Few carnivores will be unhappy with the Kansas City Beefs. 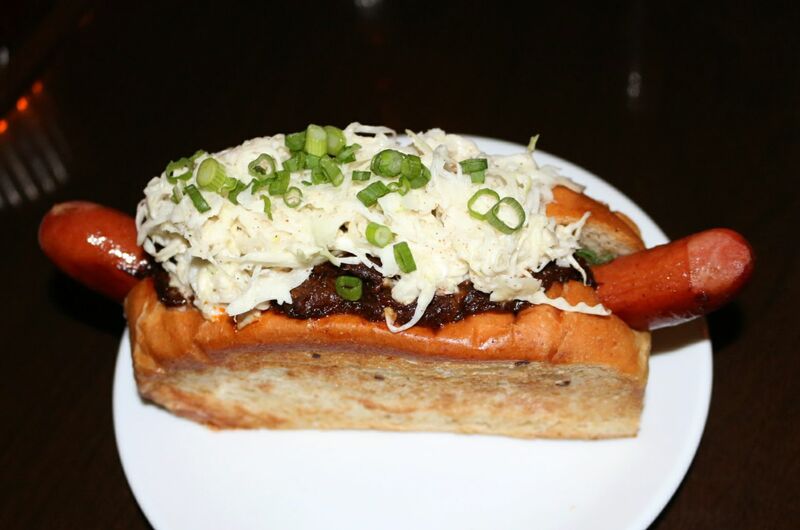 Tender, sweet BBQ beef short ribs are piled high with coleslaw on top of a grilled all-beef dog with good snap. I'll easily order this again. Achilles Meal does Greece proud with the sweet, fragrant lamb coming through on the sausage. 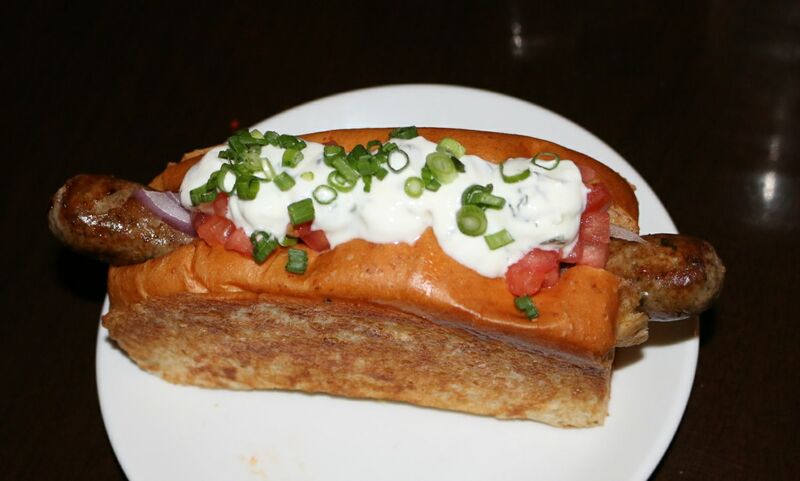 Tzatziki, tomatoes, and red onion provide freshness. 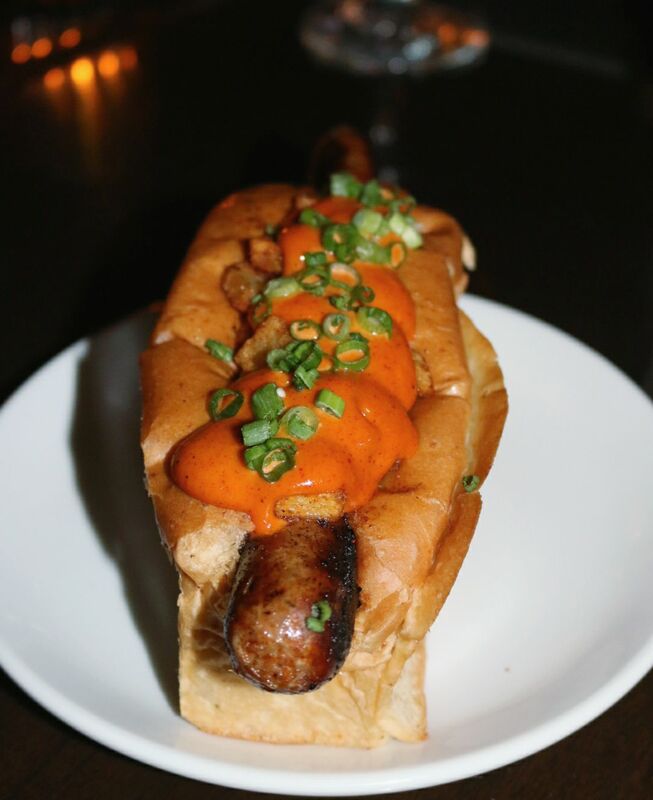 Cajun bites can be had with the Andouille Armstrong's gator and shrimp sausage. But it's the jalapeno remoulade that really kicked it up a notch. Looking for Bic Mac flavors coming at you from Queens, NY? Cleo McDowell's got you covered with the cheese and secret sauce nostalgically melding together with a pickle spear. French tastes abound with the foie and duck coming together for rich melange of richness. Red onion and cornichon provide that needed counterbalance. Pinkies up for this dog! 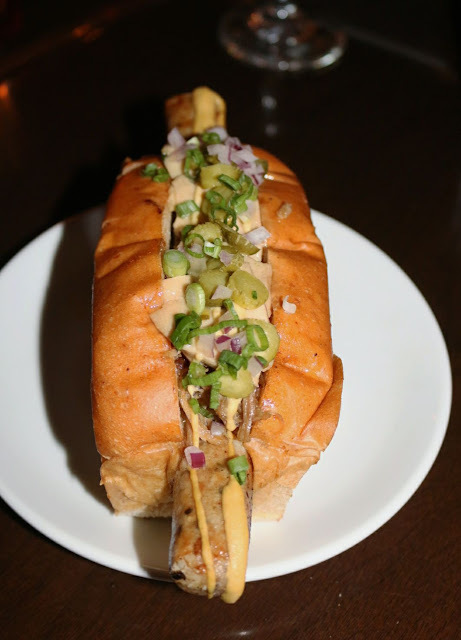 The Consquistadog will easily be a favorite, with the spicy chorizo buttressed with fried potato cubes and a killer brava sauce. Jimmy & Sean are rolling out a few new dogs as well. I was clearly a fan of the Pig Trouble in China. 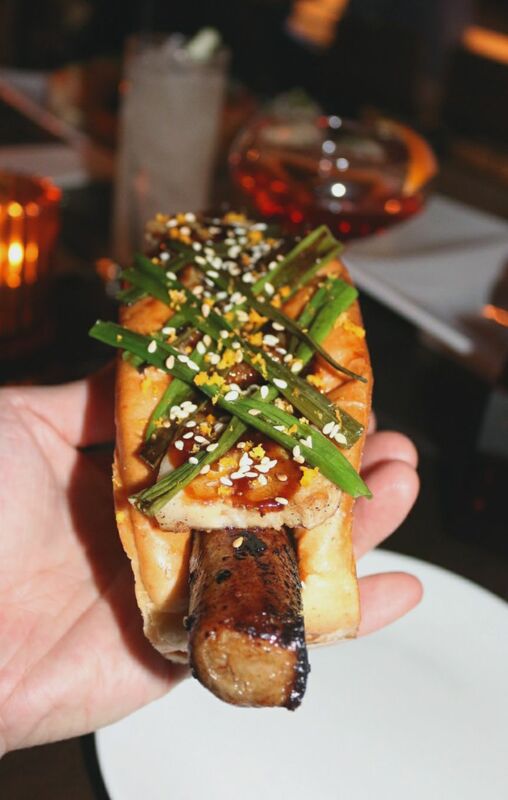 Cantonese sausage is topped with a nicely lacquered and crisp pork belly. Scallions and some texture from the sesame seeds bring each bite together. Chairman of the Board is their homage to South Philly. Boar sausage is topped with marinara, Parmesan, parsley, and even fried cheese curds. Sweet, rich, acidic - all the flavors are there. Whether you're looking for a proper spot to bring a group for Happy Hour or if you're just seeking out a wide range of great flavors, head to Destination Dogs. Also, be on the look out for travel flights of dogs and even a passport card you can stamp once you've tried each of their creations! FTC Disclaimer: I was invited by Destination Dogs & Breslow Partners. Regardless, my opinions are mine alone and, therefore, unbiased.